Rathika's Nest: Do 'miracles' really happen? Sometimes one gets to read a really good news story! 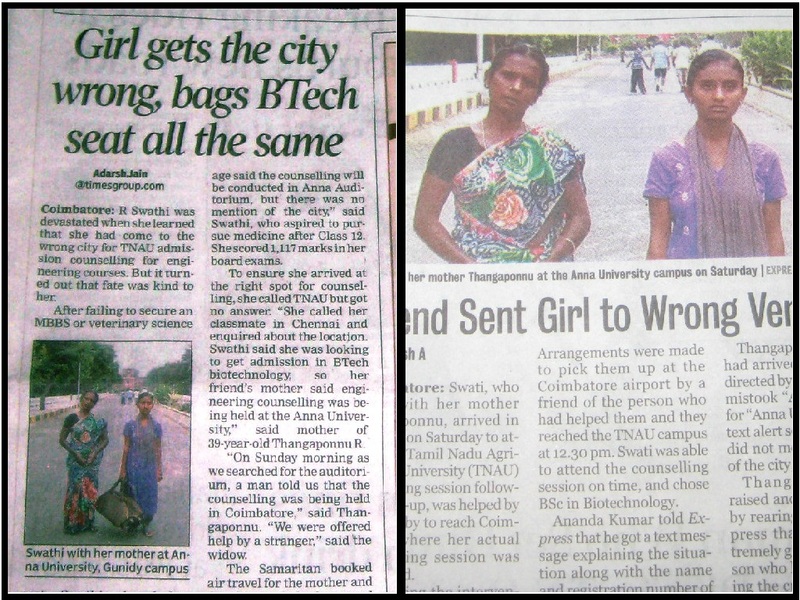 Today, I was happy to read the news item about the ‘Good Samaritan’ who had helped a girl reach her professional counseling on time and get admission to biotechnology course. 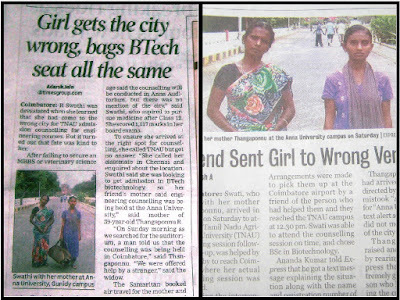 Swathi arrived with her mother at Anna University, Chennai instead of going to Anna Auditorium at Agricultural University, Coimbatore. Some kind-hearted morning walker paid for their air travel, and ensured that the girl reached the venue on time and got a fair counseling. In spite of all the chaos and confusion around, stories like this remind us that humanity is still alive and thriving! From the girl’s perspective what has happened is a ‘miracle’, and this brings to the fore a fundamental question – Do ‘miracles’ really happen? Miracle is defined as an extraordinary event that cannot be explained by scientific or natural laws. How often do we come across such phenomena? An example of everyday miracle! I believe miracles do happen. We may not encounter dramatic events like instant healing of terminal illness or physical defects. However, if we are conscious, we can recognize small everyday miracles happening time and again. All of us know the parable about a little girl who went to the ‘prayer meeting for rain’ carrying an umbrella and it miraculously started raining! Many years ago, I was very unhappy with the hospital job I was doing then, and all my efforts to find an alternate employment did not fructify due to some reason or the other. I was at my wits’ end, and like a bolt from the blue I received a call from a friend regarding an opening for a lady doctor. It turned out to be the exact kind of work I needed at that time, and after a week, I happily started my new job! A friend’s mother once recounted how miraculously she received funding from an unexpected source for feeding a large gathering! We can recollect many such everyday miracles that we tend to forget in the demands and pressures of daily life. Nonetheless, the moment miracle happens we are touched by the ‘Grace’ and are invariably conscious of it. These moments make us aware of the higher power that watches over us, and gives us the comfort and confidence that goodness will ultimately prevail. The minimum we could do is to recognize the ‘Grace’ when we encounter it and be thankful for the same.